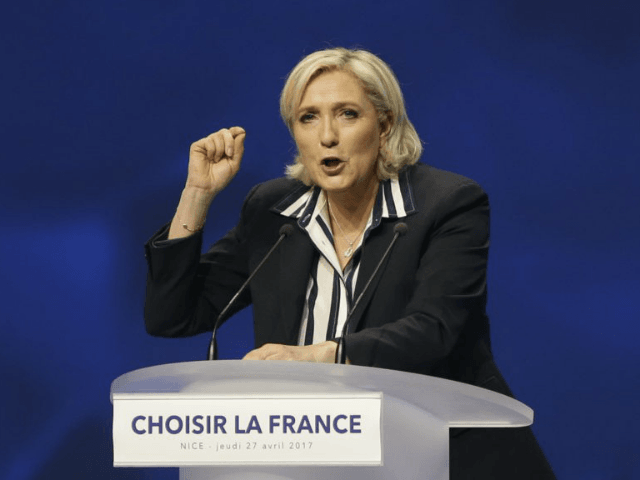 Marine Le Pen’s Rassemblement National (RN, formerly Front National) party has moved ahead of beleaguered globalist Emmanuel Macron’s En Marche! (LREM) in voting intention polls for 2019’s European Union elections. The Ifop poll, published Sunday, is the first time Le Pen’s populist conservative party has moved ahead of Macron’s recently founded governing LREM centrist group in an EU elections poll, reports Euractiv. While the latest figures putting Macron at 19 percent resemble only a slight one point fall from the last polling, they see much bigger gains for Le Pen, who has jumped four points to 21 percent in three months. As recently as may, Macron’s LREM was polling as high as 27 percent. The damning headline figures follow an increasingly troubled leadership for President Macron himself. Breitbart London reported last week that his personal approval rating had sunk to an all-time low, with just 21 percent of French voters saying they viewed his presidency favourably. While his popularity with left-wing voters remained stable, it saw a fall among centrist electors, a crucial group whose support he gained to take the presidency in 2017. The change of fortunes for Macron’s party in the upcoming European-wide elections reflects a broader shift across the continent, with Brussels commentators anticipating the 2019 vote to come down to a challenge between the old globalist establishment and the insurgent populist parties. Emmanuel Macron has told the Visegrád nations to fall into line with the EU on migrant solidarity and “fundamental values”. Seeking to change the direction of travel for the European project, populist parties are anticipating a surge in the number of MEPs elected to the EU’s parliament, even though the United Kingdom’s large group of UKIP members will be leaving in preparation for Brexit. Two of the most prominent and successful populist actors in Europe, Hungary’s Prime Minister Viktor Orbán and Italy’s deputy prime minister Matteo Salvini, announced in August they would be forming a populist front ahead of the European elections to help guide the continent in a positive direction. Speaking in Milan, Orbán said of the decision: “There are two sides at the moment in Europe. One is led by Macron, who is supporting migration. The other one is supported by countries who want to protect their borders. Hungary and Italy belong to the latter. Populists in Sweden and Germany have also seen significant gains in the past year, Poland’s populist Law and Justice party are seeing through rafts of pro-family legislationafter their landslide election win in 2015, and the populist Freedom Party now rules in coalition with mainstream conservatives in central European Austria.